This teacloth was worked by my mother as a schoolgirl. The design came from a transfer, and there was another girl in her class that was working the same one. With rather a difference. Her flowers were all lazy daisy stitch, and anything else was stem stitch, apart from the edges, and she got the whole thing finished in a term. Needless to state, as her mother’s daughter, and with the spectre of Miss Hunter in the background, my mother wasn’t going to use a stitch with “lazy” in the name. 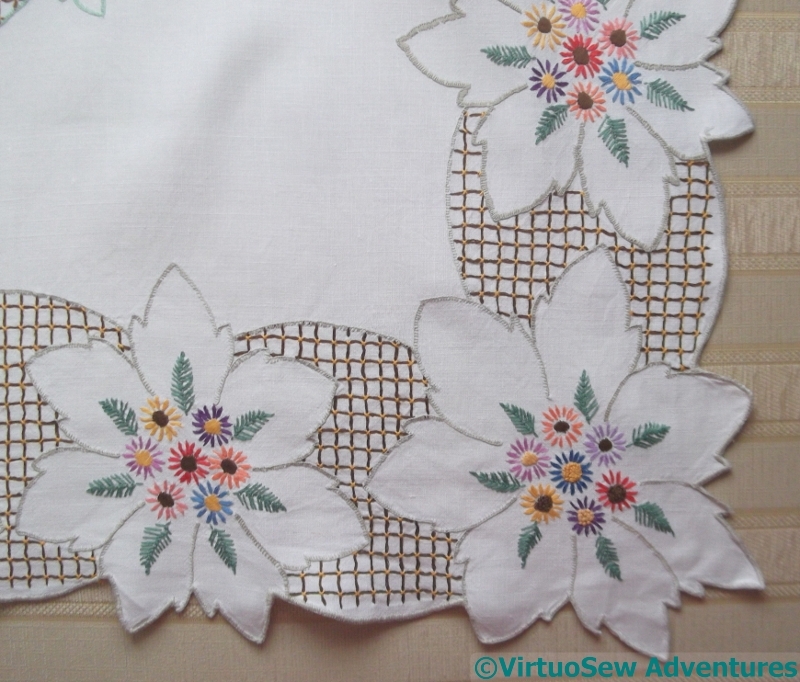 She did all the edges in blanket stitch – which with my recent experience with the Azorean Cutwork has me extremely impressed. It takes so long to make any noticeable progress with it! 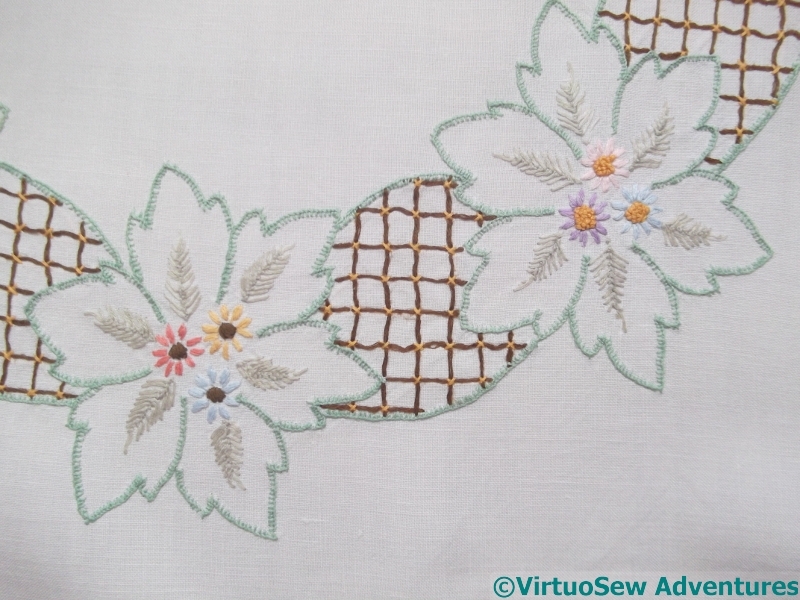 The leaves are all in feather stitch, and they’re beautifully shaped, and the flowers are satin stitch – very neat satin stitch, which again is one of my least favourite stitches, and one I only do neatly in short bursts and with something else to do in between! Of course, my mother didn’t get her teacloth done in a single term – but her teacher was so impressed with what was finished that she took it home and handwashed and pressed the completed corner to put in in the end of term exhibition. In spite of the fact that I very much doubt whether the teacher had contributed anything at all to my mother’s skill in the matter! This is so beautiful. 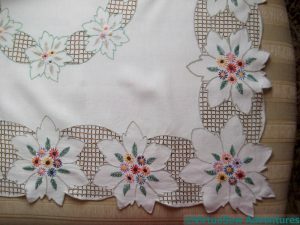 Being more the ‘lazy daisy’ sort of stitcher I can’t imagine doing anything as intricate as this. And the lovely thing is that you have inherited that talent from your mother! this is stunning and how wonderful that you have it to share with us…..
What a beautiful momentous and story to go with it! Such beautiful stitching and despite what you may say – like mother like daughter! Not just neatness and good eye: it shows impressive amounts of patience and dedication to finish the whole cloth. I particularly like the lighter colours used in the centre. 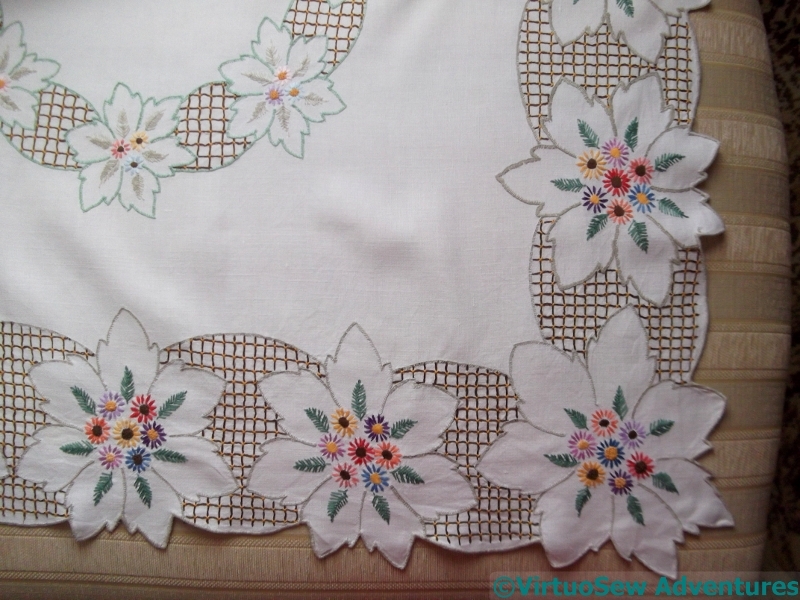 My mother’s one attempt at a small tablecloth survived in our rag-bag for many years: one corner worked, a flower basket in rather dodgy lazy-daisy, and even that only partly finished. I think it took about eight years to finish it! I was just more interested in hockey than embroidery in those days! 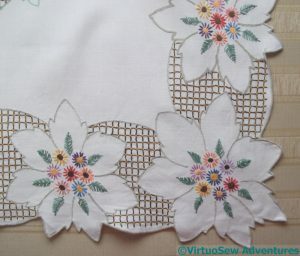 Even so, I couldn’t have been satisfied with “lazy-daisy”, or stem stitch instead of buttonhole for the edges. It wouldn’t have looked right. What a funny mixture children are – both then and now. All the nice tablecloths had those lovely buttonhole edges. 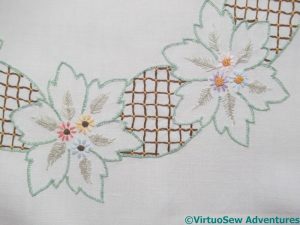 As a teenager my buttonhole stitch was terrible, I was so glad when a similar stitch turned up on the new sewing machine. I’m glad to see you appreciate the work put in, I keep seeing cloths like this in the Charity shops. How can people throw them away? Your mother’s work is beautiful. I love those flowers and the edges are amazingly precise. Beautiful and quite the heirloom! such a beautiful tea cloth.Your mother had worked with trellis and blanket stitches without losing interest half way through as a young girl ,wow!